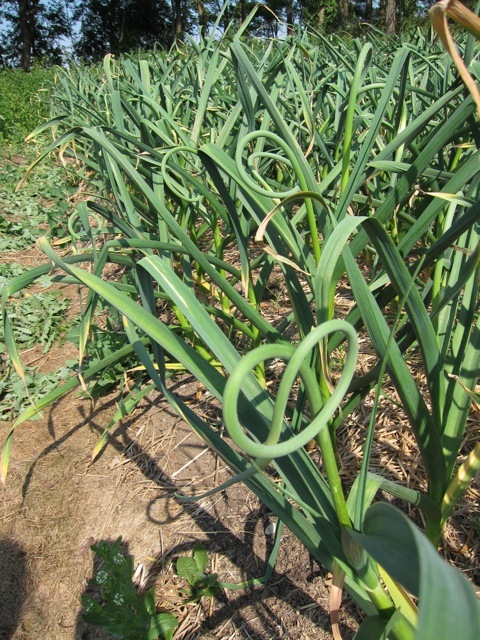 It’s just the end of May, and it amazes me that the garlic has thrown scapes, the fireflies have made their debut, the tomato plants are beginning to blossom, and the bees have already gathered a harvestable amount of honey. Forgive me if I am redundant in saying this but nearly everything continues to be four to six weeks earlier than normal! It makes me wonder if this is becoming a new normal or if it’s further sign of unpredictable climate changes? I am excited that it is finally time to sell vegetables again! We delivered the first of this seasons vegetables to Moveable Feast last week, with more to come this week. Also, this week marks the first market of the season for the Fox Plot. We’ll be hawking our vegetables this coming Friday (and every Friday thereafter) in St. Charles from 7am to 1pm. I always worry that there won’t be enough produce to take to market, but I think we’ll be okay. The recent heat has caused the radishes to bolt, and the tat soi as well. I want the garden to slow down just a bit, just make it to Friday for harvest! We will have: hakueri turnips, kale (three varieties! ), lettuce heads aplenty, tat soi, boc choi, and yukina savoy, and possibly some napa and savoy cabbages (though it’s hard to say what’s left untouched by the slugs). I’m planning also to bring a few trays of starts- kale, cauliflower, broccoli, basil. I have some honey left from last year’s harvest as well. The bees have clearly not noticed my somewhat absent beekeeping methods. They seem to be doing better than ever! We checked them today and I was pleased with what we found. The two oldest hives are seriously into honey production now, having filled up at least a super each, and more on the second one. We add a second super to one and a third to the other, making them look like small white skyscrapers in the landscape of LaFox. 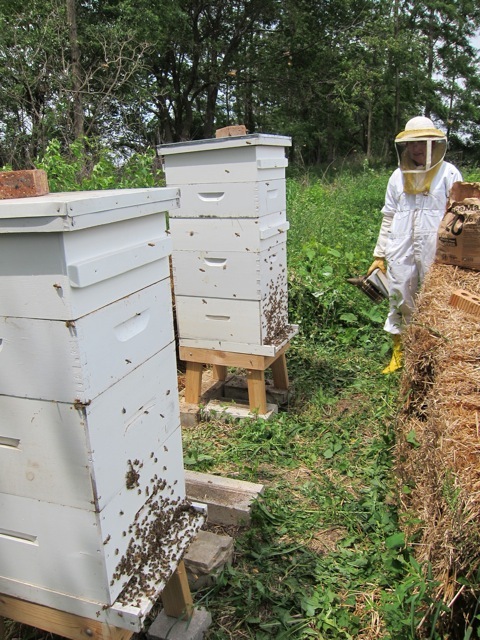 The two hives just installed this spring also seem to be well. We spotted one queen and saw consistent brood patterns. 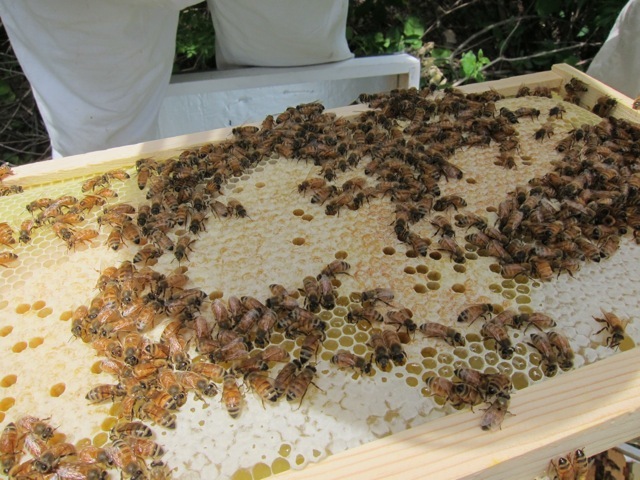 The swarm hive had in the past two weeks filled out an entire brood box! The queen of this hive is one we bought last year to requeen a queenless hive, and unlike the package bees, this is an Illinois queen. As swarming goes, the old queen (our Illinois queen) leaves with a good majority of her workers bees and sets up camp somewhere new. Meanwhile, the bees raised a new queen (a daughter of the Illinois queen) and she stays with the remaining bees behind at the hive. As an aside, I got my annual sting this time around. I average about one a year, not too bad considering those hives can contain up to 80,000 in one hive! As usual, I was more or less asking for it. I did not put my gloves back on as we shuffled some brood boxes around, and one little defender of the hive did not like this and stung my right hand. And no, it’s really not that bad. The garden continues to take it’s shape, as nearly all the rows have filled. The potatoes have been up for nearly two weeks, and we had enough to plant more than we’d planned. I spent about two hours yesterday watering each of the rows, taking stock of how each of the different vegetables are doing, and pulling the biggest of the weeds. The earliest planted vegetables grew fast and large enough to out pace the weed growth, but the onions are swimming in volunteer tomato plants and lambs quarters. I had one of those moments where I am struck by how much food there is out there and how much work it is. When I finally gave up to the dying sunlight and called it a day, it was 830pm and I was muddy from head toe, full of thistle scratches, ravenously hungry, and entirely pleased with myself. Update: My apologies for the delay in posting. The wee little bee sting that doesn’t hurt much to start managed to inflate my hand past the point usefulness over the course of the week. Five days later, it’s almost back to normal and I’ve learned my lesson about taking off my gloves and remembering to put them back on next time.